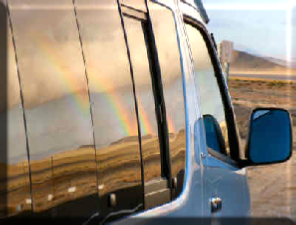 What Vehicle will suit my holiday best in Namibia? 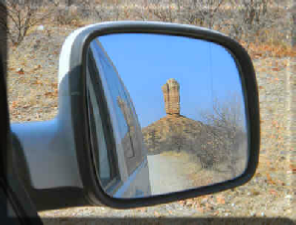 If you are considering a “Self Drive” Tour through Namibia, choosing the correct vehicle is very, very important. If you choose the wrong type of vehicle, you could directly endanger your life and the lives of your passengers. I see lots of guests trying to save money by hiring the cheapest car (often the small sedans) - the only result is that they are so tired on the 3rd day already, from constantly concentrating on keeping the vehicle on the road, and mainly because most guests have no idea how tiring, noisy, irritating and dusty most smalls cars get by driving only for 45 minutes on a slightly corrugated road. 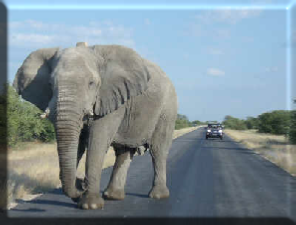 An average driving day in Namibia rarely has less than 4h30min, and if the roads have not recently been graded, I found that guests are so irritated by the time they reach their accommodation, that bickering, complaining and even fighting between each other normally takes place. 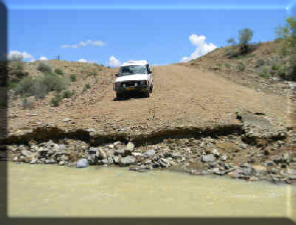 Always take into consideration that although in general our roads are very good, we often have stretches of 30 - 90 km that has not been recently graded. The handling of your car on these stretches directly influences your mood, and therefore also your experience in Namibia. Small cars have smaller tyres, and therefore get cut and punctured by our stones much more frequently. Always make sure you have at least 2 spare tyres with you, ESPECIALLY if you are driving a small car. 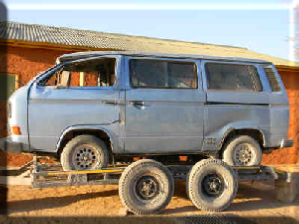 A larger vehicle (like a Toyota Hilux, Nissan Hardbody, VW Kombi 1.9, Hyundai Tucson etc.) will always have more advantages over a smaller car, in cases like tyre strength, better game viewing, better gravel road handling, and a better overall Namibia experience.  Check your engine oil and tyre pressures daily, it is possible for stones to do underbody damage to the car, therefore also check for oil spills under the car in the mornings. A slow puncture on a tyre (loses air slowly) can become overheated by friction and result in a “blow out” after which the tyre is irreparable. 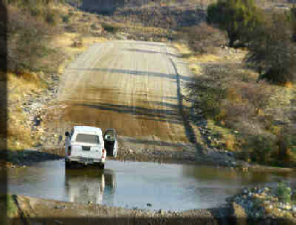  Never brake around or in a corner - ESPECIALLY not on a gravel road, often there are river dips in the corners with soft sand and a change in the level of the road, this is how most people roll their vehicles. Rather slow down to a safe speed BEFORE reaching the bend, and accelerate gently through it. TAR ROADS: Distance (km) divided by 80. Therefore if you have 300km to do on Gravel, your driving time will be roughly 5 hours. Then you still need to add stops as well (photo, toilet, lunch, fuel etc).  Fill up at any available Fuel station, if you are unsure, ask your accommodation, or phone ahead to make sure if a fuel station has Petrol/Diesel. KNOW what your vehicle can drive on a tank of fuel, and use this information to plan ahead. Important: when refuelling, tell the service station assistant if you need Petrol or Diesel, PAY ATTENTION and double check that: (A) - You are being supplied with the right fuel, and (B) - your fuel cap is replaced properly. Trust me - this can save a lot of time and stress later.  A flat tyre is a very common experience. Use this opportunity (not to swear and fight with each other as is often the case) to first stretch and take a short break. Explore the surrounding area and see if you can find interesting stones. THEN change the tyre (apply handbrake, first loosen the nuts, then jack up the car. Have the spare tyre ready BEFORE you remove the flat. Switch the tyres - fasten the nuts, jack down the car and fasten the nuts again properly.) 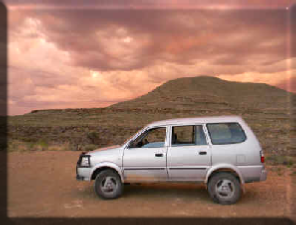 If your vehicle is too low for the jack to fit under (as in soft sand), find a suitable size square stone, and possibly a smaller one to use as a “drive up step” and drive the flat tyre up onto the stone, as to gain enough height to fit the jack under the car.  Take care of “Mirages” in the road, or “dry water”. Drive with your normal lights on (NOT YOUR BRIGHTS!) to be more visible to other vehicles in these mirages and also in dust. you will be unhappy with most of your Namibia experience! 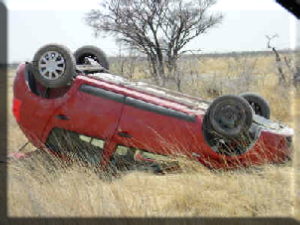 The most dangerous vehicle accidents occur when a vehicle is rolled, either due to jerking the steering wheel at speed (for example when trying to miss a warthog or animal running across the road), or when the vehicle skids out of control (maybe after blowing a tyre) and the brake is applied. Remember, the brake pedal is your worst enemy when a vehicle is momentarily out of control! Please be well rested and alert ALL the time, don’t become another “foreign statistic” on our roads..